My first major find was a book by David Homer Bates called “Lincoln in the Telegraph Office”. Along with my great great grandfather Bates was another of the “4 Immortals” and published this book in 1907. When these 4 men answered the call to war they were first stationed in key areas around Washington DC. Bates was assigned to the War Department and stayed in that post throughout the entire Civil War. He was quite possibly in the most unique position of any telegraph operator as President Lincoln spent many hours in Bates’ office sending and receiving messages. 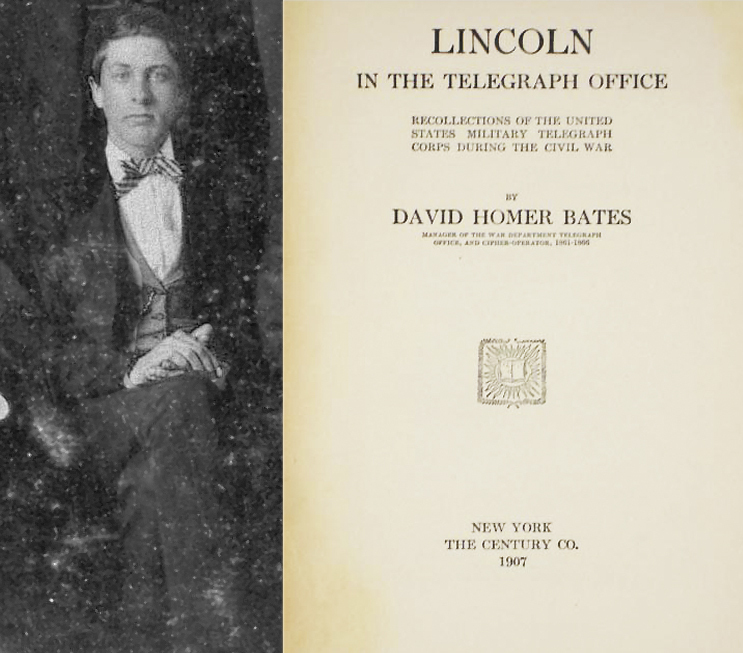 Besides getting to know the President personally, Bates tells of Lincoln writing much of the Emancipation Proclamation in the telegraph office of the War Dept. As for my family history Bates mentions Richard O’Brien on multiple occasions, along with Richard’s younger brother John Emmet. From these citations I learned that John was also active as an operator in the Civil War and that they were both stationed at Fort Monroe in Virginia. John Emmet is 13 when enters the service. A few other names come up in this book that prove to play a role further down the line like Thomas Eckert, William Plum and Anson Stager. It is from this book I learn that the Unitest States Military Telegraph Corps remained a civilian organization throughout the war and was funded for the first seven months of the conflict out of the pocket of the Pennsylvania Rail Road. Another item found among my grandmother’s things was this picture in a case. 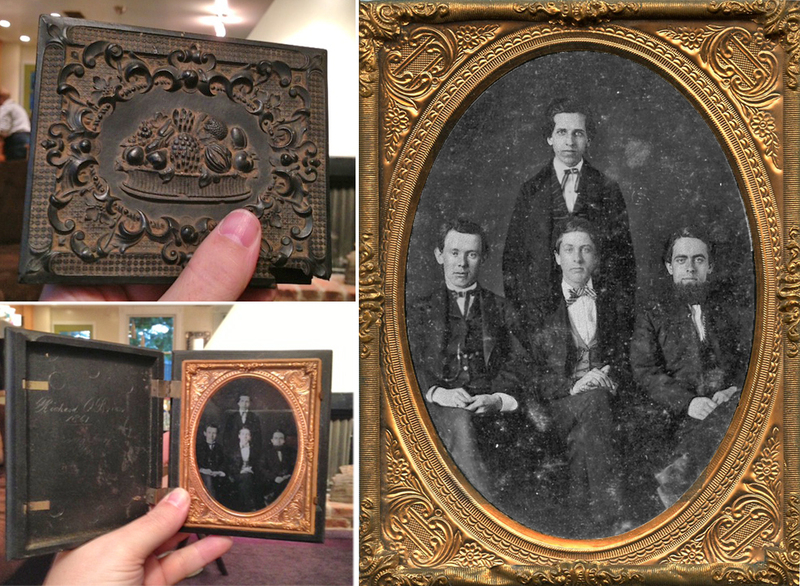 The picture itself is an ambrotype (on glass plate) and the case features the inscription “Richard O’Brien 1861” on the inside. The image is of four young telegraph operators, now know to be “The Immortal Four”. These were the first four men to answer Andrew Carnegie’s call to action. They were David Strouse (left), David Homer Bates(center), Samuel M. Brown(back) and Richard O’Brien(right). About a week after the attack on Fort Sumter the nation began choosing up sides to go to war. It was clearly shaping up to be a war between the North and the South. However, at the outset, it wasn’t so cut and dry. People with opposing sympathies were living side by side, all mixed together and spread throughout the county. Nowhere was this volatile mix of opposing Americans so concentrated as it was in Baltimore. Washington DC, was below the Mason-Dixon Line which put the Union capitol in southern territory. As people sympathetic to the South left the capitol they cut the telegraph lines from DC. In a pitch to isolate the capitol and prevent Union troops from coming to her defense Southern supporters in Baltimore cut telegraph lines from DC. They also destroyed train tracks between Baltimore and DC as well as tracks from Baltimore to Philadelphia. James Cameron, Lincoln’s Secretary of War, called upon Colonel Thomas A. Scott, who was then Manager of the Pennsylvania Rail Road. Scott and his Assistant, Andrew Carnegie, made their way to Washington to assess the situation. Upon finding such dire conditions in the nation’s capitol Carnegie sent the following message to the office in PA. requesting telegraph operators. Richard O’Brien was nineteen when he left his family and answered the call. Richard O’Brien’s name turned up in an article from the New York Times published in November, 1908. 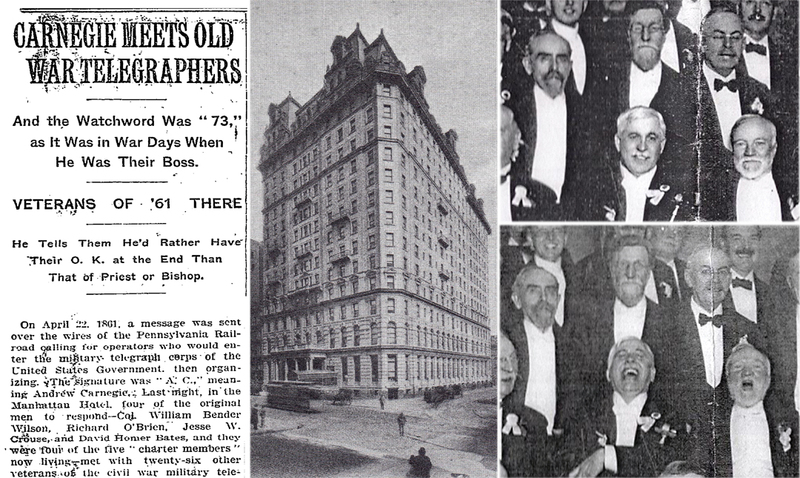 It describes a black tie benefit dinner at the Hotel Manhattan (which no longer exists) for the members of the United States Military Telegraph Corps. Richard was a key note speaker along with guest of honor Andrew Carnegie. This is the first image I have seen of Richard. He is the gentleman on the left with the pointed beard and thick eyebrows. His younger brother, John Emmet, is on the right wearing glasses and a black bow tie. Andrew Carnegie sits in the front row directly in front of John. The article details the plight of the members of the USMT. Throughout the Civil War the USMT remained a private organization. As a result none of it’s members were entitled to the kind of military benefits afforded to soldiers, even though they were often put in harms way. Their sacrifice was just as great. Carnegie has created a fund for surviving veterans and their families to assuage the hardships many faced after the war. Members would meet annually at this fundraising dinner. The number “73” was a positive salutation code between telegraph operators meaning “God be with you”. It was a shorthand way of spelling out something like “sincerely” or “regards” at the end of a message. Similar to a smiley face emoticon in today’s text messages. 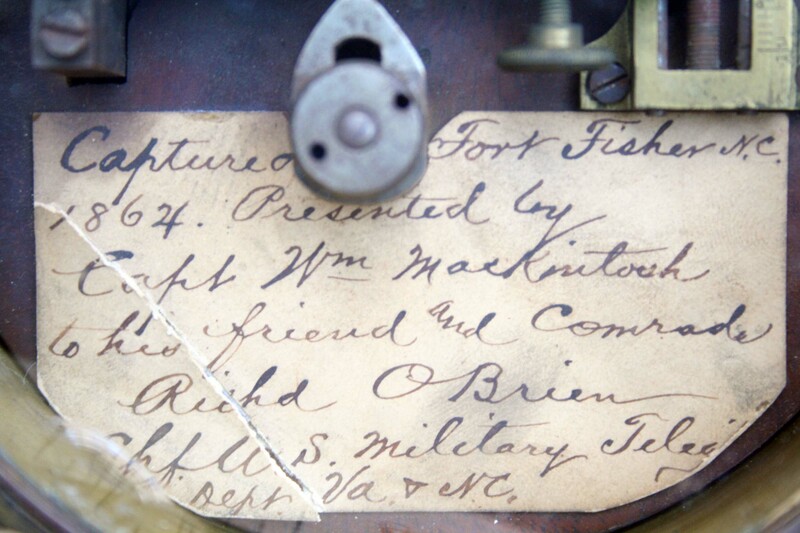 “Capture of Fort Fisher, N.C.
Who was Captain MacKintosh and the Military Telegraph? And what happened at Fort Fisher? Beyond those references I would include the key words “Richard O’Brien” and the “telegraph” and, starting with the easiest resource, see what Google would turn up. The first few things I found went a long way to fill in the picture. I didn’t find any references to Capt. MacKintosh. Yet. However, Richard’s name was mentioned in a book called “The Military Telegraph During The Civil War in the United States, With an Exposition of Ancient and Modern Means of Communication, and the Federal and Confederate Cipher Systems” By William R. Plum. The references to Richard were seeded in three or four paragraphs spread throughout the book. It also mentioned a Fort but not Fort Fisher. It was Fort Monroe.